KARACHI: A joint workers’ action committee comprising representatives of media organisations, as well as trade and labour unions, set up a protest camp outside the offices of a newspaper on Thursday to protest job and pay cuts in media houses. Political and religious parties also took part in the protest. The protest brought together the three factions of the Karachi Union of Journalists, both factions of Apnec and a number of trade unions on one platform. As leaders of political parties and civil society continued to visit the camp, a portion of I.I. Chundrigar Road was closed and traffic was diverted to alternative roads. The demonstrators carried banners and chanted slogans against retrenchment and non-payment of salary to workers of media houses. The speakers called for formation of a joint investigation team to probe financial assets of media owners. 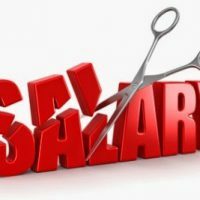 They urged the government to take note of retrenchment and non-payment of salaries. Among others who spoke on the occasion were Karamat Ali of Pakistan Institute of Labour Education Research, Karachi Press Club president Imtiaz Khan Faran, secretary Arman Sabir and Apnec leaders Dara Zafar and Shakeel Yamin.